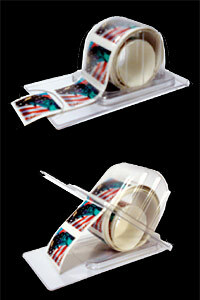 Our StampKeep Postage Stamp Dispenser is the simplest to use & least expensive stamp roll keeper on the market. Unlike other stamp dispensers and holders, our plastic is clear and you can actually see how many stamps you have left! It’s so easy to load and dispense your rolls of stamps, you’ll wonder "why didn’t I think of that!" Just pop the clamshell top open, insert your roll of postage stamps, and close tight. The dispenser protects the roll and allows you to easily pull out and peel off your stamps. The holder is made of sturdy plastic that snaps closed, you will get years of use from our dispenser at a fraction of the cost. The StampKeep is proudly MADE in the USA! Click here to view or download the StampKeep sales brochure in pdf format. The StampKeep is sold in retail outlets around the country, including mail and parcel centers, office supply stores, and variety stores. We are currently working with the US Postal Service to make the product available at your local post office. StampKeep is sold and shipped on a hanger card. You can also purchase in bulk via a multi-pack or case pack. Each multi-pack box contains 18 dispensers, while a case contains 12 multi-packs (or 216 dispenser units). Since business customers purchase the majority of stamp rolls, this item is a great business-related item.